It now appears that many harness fans will forever wonder if Manofmanymissions would have passed Broad Bahn in the Hambletonian if the quirky trotter had not begun to run. 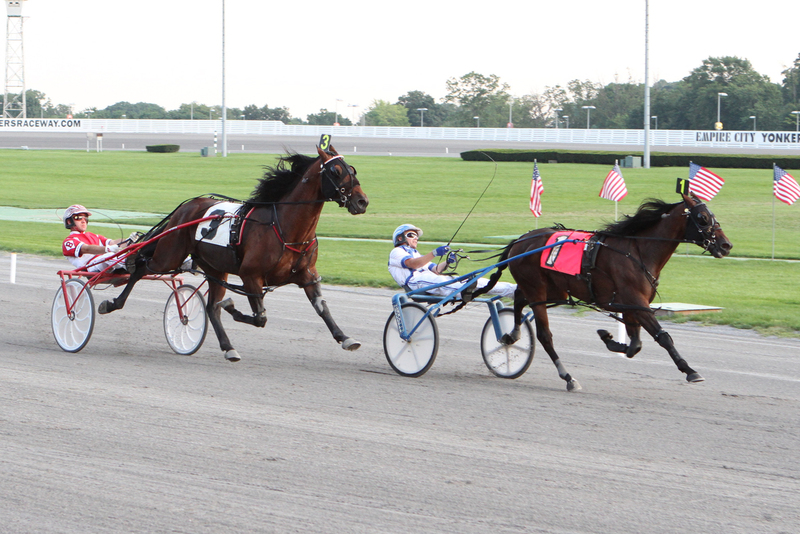 “Man” won his next outing—from post 10—at the Meadowlands but “Bahn” was absent from that contest. Man faced Bahn on Super Stakes Sunday at Chester this past weekend and beat him soundly. Can you consider it a rivalry? We have to wait for the Breeders Crown to fully appreciate the joust. Our success this weekend was a down-and-dirty call of the William Haughton Memorial, featuring the gutsy free-for-all pacers that have adorned this blog season after season. Our contenders, Alexie Matosie and Foiled Again, finished first and second, respectively. Though we called for the latter to be the winner and the eventual winner to complete the exacta, both were sent off at 8-1, allowing for a box. “Matosie” paid $18.40 to win and the combo paid $93. The way money runs through the “windows” these days, that payoff price seems generous. Many of us who adhere to the standard exacta value chart know that $93 for two 8-1 shots is an underlay. But that chart is now on trial, considering most “fairly calculated” exactas from its columns are near impossible to receive, no less promised in probable payoff flashes. We will accept the $93, since watching the probable payoff flashes did not reveal the final calculation of the actual payoff. We Will See was the huge favorite. As readers of this blog should know, we were not high on that horse as a glamour colt and did not feel he was the best at four against the likes of “Foiled” and the others making up the “Haughton” field. This proved that. 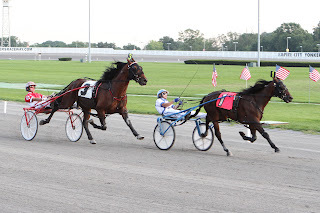 Our Super Sunday choices may not have handed you the winner but we did continue to prove this year’s Hambletonian a key race as Charlie De Vie won a Colonial Consolation. Like Man, “Charlie” has had his issues with a smooth gait but when he is at his best he can even beat Man, as he did fair and square this season even though Man broke in the event. Charlie only paid $5.60 but probably should have paid $3. Speaking of winners that should have paid any certain price, we mentioned that See You At Peelers would easily win the Valley Forge Final, tolling her 22nd-straight win, but we never imagined her paying $3.60. Drop The Ball and Krispy Apple both went off around 7-2 and that showed a lot of faith against the soph-pacing filly that has already locked in division honors. We offered Idyllic for the exacta but Krispy Apple got that spot and Idyllic completed the tepid triple, worth $19.40. We were close in the Golden Girls, as Anndrovette took second. Rock N Soul’s performance was a mystery; she did not fire. The favorite, Dreamfair Eternal, who we supported when she was younger and not so popular on the tote, won, setting off a dreary $14 exacta with our upset choice. Alsace Hanover took second in the Battle of the Brandywine Final. Oddly enough he was the favorite to Roll With Joe, who beat him and combined for a pocket-change exacta of $15.40. Finally, Shadyshark Hanover got second in a “Battle” consolation, defeated by Wind Me Up, from team Teague. That exacta came back $27.40, a price that looks good compared to some of the offerings we have mentioned. In Canada, one of the Nassagaweya elims was a gift to readers as Special Blend won and paid $14.70. Our other elim choices, Shakerattlenrock and D Terminata, finished second. Like “Peelers,” American Jewel won and paid a surprising $3.90 in her elim for next week’s Eternal Camnation Final. Thank you all for following us on Twitter. Please continue for all harness updates and join if you want to get the kind of info and opinion no other harness-Twitter account offers you. As well, we have some fun. Brian Sears won his sixth of seven driving championships when the Meadowlands closed its 2011 season. Following him, in order, were Tim Tetrick, David Miller, Andy Miller, Yannick Gingras, Ron Pierce, Simon Allard, Mike Lachance, John Campbell and Brandon Simpson. The Meadowlands closed on Aug. 20 with some tears and memories hovering over the facility. What happens now to the flagship harness raceway? Jeff Gural, the head of the new, private group that took the track from the uncaring hands of the state’s governor, is looking ahead to 2012 as things change rapidly with the swampland’s plant. Coming to the Meadowlands are a new head of operations, a new racing schedule and a strong get-tough policy on trainers and/or drivers who do not play by the rules. Mr. Gural is interviewing for the person who will run the racing operations. As well, he said he hopes to have a new management team in place shortly. When the track re-opens, there’s a chance some familiar horsemen will be asked to race elsewhere. Gural believes integrity is a serious issue for the industry and may chose to keep some people out. A new racing program is in the works. Mr. Gural said the track could open the Friday before New Year’s Eve, Dec. 30, or the first week in January. “We’ll still race around 81 days,” he said. Construction on the new grandstand will begin around the first of the year, hoping to be completed by May, 2013. The paddock will be redesigned so that horses can ship directly into it instead of a receiving barn. I love this Blog ! keep up the great work team ! I am also a huge harness fan and will spread the word ! I cant wait for the opening of the new meadowlands ~ Lets get as many fans together as possible for the opening !